Scroll through a tumblr feed and you’ll be able to pick out photographer Akif Hakan Celebi’s photos from a mile away. His Lightroom’s a daydream of exaggerated colouring and out of this world contrast, creating unbelievable scenes scooped right out of a hallucination for your viewing pleasure. I’ve been following his work for a few years and have been hooked ever since, following him from his quirky fashion shoots to his sensual personal snaps. Armed with a love of director Wong Kar Wai and a flair for improvisation, we’re lucky this Turkish/American photographer decided to make Hong Kong his home - the +852 would be a little duller without him. More on running through the desert and photography gear in our interview coming right up. I was working as a cameraman for a TV station in Miami. However, the channel I was working for shut down its national operations and I was left unemployed. I had lots of free time to experiment with other fields and always interested in photography. With all the new digital gear on the market, I wanted to try it more seriously. At the time, seeing what I shot on a small LCD screen right away appealed to me and I enjoyed creating photos instantly. You’ve got a pretty international background and moved around a bit before settling in HK. How’d you wind up here? I’ve always been interested Far East Asia and wanted to visit. I also had some online friends from there, one of whom become a very close friend in person. She was also a photographer/model and had always told me good things about Hong Kong. She said I’d really love it here and that I should try it out. I finally gave myself three months here and in just my second week, I decided that I wanted to base myself here for a long time. I just love the place. It fit what I want to do perfectly and the lifestyle that I want to have. After being here for the last 4.5 years, I can say it’s helped me polish and establish my own style. The work I’ve done here has helped distinguish me from other photographers. So I’m very grateful to be here. Your work has this crazy surreal quality to it, particularly your series ‘Desert Freaks of Noah Purifoy’ (above). Drugs aside, how do you come up with your creative vision for a shoot? That shoot was proposed to me by a friend living in Los Angeles. She told me she had many friends who are street and circus performers and that it would be interesting to shoot something at Noah Purifoy’s desert installation site in Mojave Desert. It was perfect because I’ve done similar shoots in the desert with a fashion designer of mine, so it was something familiar. It’s just what I like to see. I don’t think about it in detail. I shoot what I’m interested in seeing, using what I have in front of me - it’s just on-site improvisation. All the information is in my subconscious and informed by my everyday life, whether I’m observing people on the street, watching movies or looking at other’s work. So who I am and what I like reflects what I shoot, naturally. I don’t shoot photos to characterise my life, I live my life to shoot photos. It all happens organically and honestly. On your site, you refer to your photographs as stories and every series has an almost poetic title. Do you see every project as a narrative and what kind of stories are you drawn to? The titles and the stories reveal themselves after I am done with photo taking. I have no idea how the story will evolve before a shoot. I enter it with an open mind and have no boundaries, going where it takes me. And after the shoot is done, the story makes itself known. Which artists and photographers inspire you? Nobuyoshi Araki, Shuji Terayama and Wong Kar Wai are my main inspirations. But there are many other unknown photographers I do follow and have much respect as well. I’ve noticed you’ve launched a couple of side projects where you shoot on polaroids or film. Do you feel like there’s something to those mediums that digital photography can’t offer you? I like experimentation and surprise of polaroid or film, I never edit them. I keep and share them as they are, since I respect each film’s characteristics and don’t want to modify it. There’s a artistic depth and realness to it. I think fillm still looks much better in print than digital. My favourite photo series is one you shot in Xitang back in 2013 called Love Stories and Its Confusing Complications (above) – it always reminds me of the Chinese films In the Mood For Love and Lust Caution. Are you quite inspired by Asian culture and film? I’ve always loved the aesthetics of Asian cinema and the mood Asian models convey. I’m very influenced by Hong Kong director Wong Kar Wai’s films - the movie you mentioned by WKW (In The Mood For Love) is one of my favorite ones. 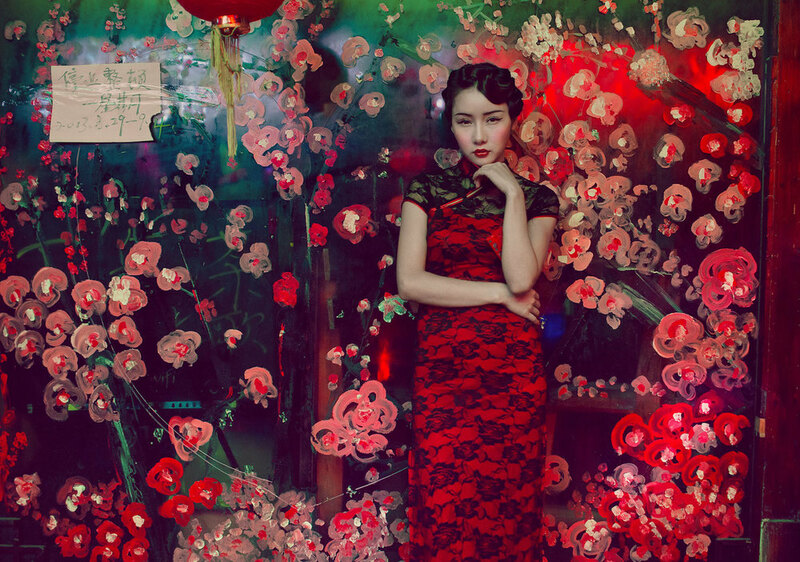 Xitang is a tradional little Chinese town, so it made sense for me to shoot my model there in a Qipao. You’ve said before you find your models on social media or just on the street. You’re always able to capture this incredible sexual intimacy in your personal photographs, how do you approach models and build that connection? I don’t talk too much when I shoot, I’m mostly silent actually. I don’t aim to create any kind of sexual intimacy or any other vibes. I want it to happen naturally and I go along with it. It doesn’t happen with everyone: some girls are more distant, so the photos take different angles. I always manage to get best out of what they are willing to reveal. With the rise of Instagram, camera phones and DSLRs, everyone and their mum thinks they can be a photographer. What do you think makes an amazing photographer? You need to consistently take great photos all the time and be honest with your work. I think if someone really wants to be a photographer, they have to do it full time - otherwise I just see them as hobbyists. I don’t really take them too seriously. They have to dedicate 100% of their time to photography to get my respect. Yes, it’s maybe a bit much to ask but being a true photographer isn’t easy. It takes dedication and sacrifice.